Megan Zavieh is an attorney with a broad range of litigation experience now focusing on attorney defense in the California State Bar disciplinary system. After graduating from law school at the University of California at Berkeley School of Law (Boalt Hall) in 1999 at age 21, Megan launched her career with a Federal Clerkship in New York. She followed that with employment at three New York area law firms where she honed her litigation and electronic case management skills. In 2010 she launched her own practice focusing on California State Bar defense. 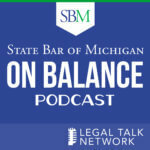 This week, Megan Zavieh joins us to discuss the byzantine advertising rules imposed on lawyers. Plus, we also talk about her new chatbot and podcast, Lawyers Gone Ethical. Andrew Garcia and Megan Zavieh talk about law firm names and why they don’t have to be boring. How to reinvent a new business model for your law firm when you're feeling sluggish. Three TBD Law alumni to tell their stories of overcoming personal challenges and how their careers were affected.